Comparison of 4K Ultra HD and other common 16:9 aspect ratio monitor resolutions. For a list of games, see games that support 4K resolution. 4K Ultra HD (also 4K UHD or simply UHD) refers to a new standard of screen resolution at 3840 pixels wide and 2160 pixels tall. It is important to note that 4K refers to the horizontal resolution, in contrast to others, such as '1080p', which refer to the vertical resolution. 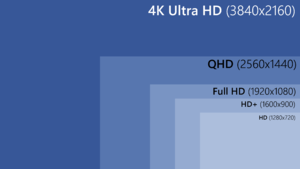 4K Ultra HD is therefore also known as '2160p'. Far higher resolution and pixel density leads to greater clarity and reduces the need for anti-aliasing. Modern graphics cards are finally powerful enough to achieve 4K resolution at smooth frame rates. A single GTX 1080 Ti can play many modern games at 4K at 60 FPS on ultra/maximum settings, and can even achieve 120+ FPS on most older titles up to about 2012 to 2013. Some games do not support 4K UHD natively. Running games at this resolution requires a high-end rig - in 2013, achieving 60 FPS at max settings on Metro 2033 required four NVIDIA GTX Titans. Mainstream 4K displays are currently limited to a 60 Hz refresh rate. 4K monitors with a high 144 Hz refresh rate were released in mid 2018, but the initial retail price is extremely high ($2000 for 4K 144Hz including HDR and G-Sync). Additionally, even very powerful modern systems are still not able to achieve anywhere near 144 FPS in 4K in the most recently released games. . At the end of 2018, the only way to be consistently certain of achieving 100+ fps in most modern titles at 4k is with 2 2080 TI cards in NV Link SLI, which would cost approximately $2500 for the GPUs alone. WSGF have a set of medals relating to a game's support for 4K Ultra HD. Similarly, the site also contains information on how to force individual games to support 4K Ultra HD. The vast majority of games have yet to be rated by the WSGF for their 4K Ultra HD support. PCGamingWiki uses icons in the video settings table to illustrate the level of 4K UHD support awarded to a game by the WSGF. Equivalent to an A-grade from the WSGF. The game has received a perfect score from the WSGF for its 4K UHD support, and is '4K Ultra HD Certified'. Equivalent to a B-grade from the WSGF. The game is without major flaws in its 4K UHD support, but has at least one blemish that prevents a perfect score. Equivalent to a C-grade from the WSGF. The game has some level of 4K UHD support but has significant practical issues. Equivalent to an unsupported grade from the WSGF. The game is unplayable in 4K UHD, or the image may be stretched to fit the window. Equivalent to an incomplete or unknown grade from the WSGF. Analysis of the game's 4K UHD support has not yet been completed. 4K support on Linux, especially at 60 Hz, can be spotty due to the varying quality of drivers and their ability to stitch together DisplayPort MST panels. hax11 attempts to work around similar issues by intercepting and editing X11 requests between games and the X server. This page was last edited on 2 February 2019, at 08:22.